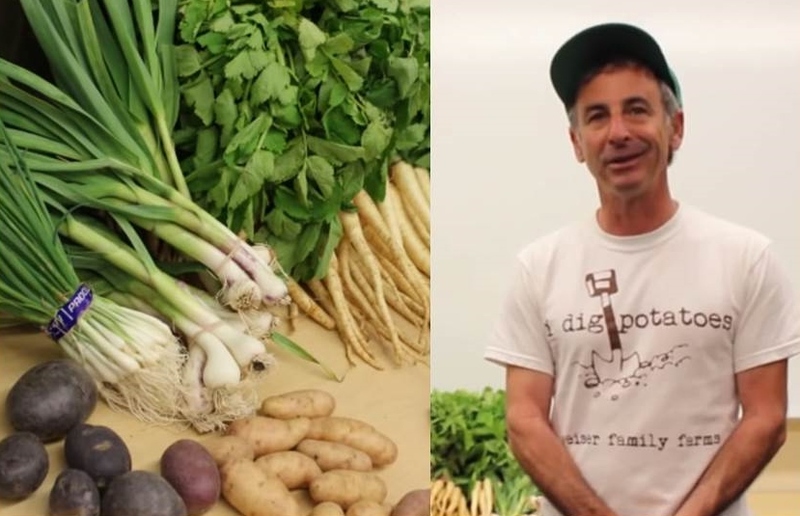 Alex Weiser stopped by the 2013 Science & Food course to share his love of potatoes and other tasty veggies. Alex Weiser digs potatoes. Literally. As a grower for Weiser Family Farms, Alex Weiser is known for his year-round supply of tasty (and colorful) potatoes. All Reds, Butterballs, Purple Peruvians, Red Thumbs, and Russian Banana Fingerlings adorn Weiser’s farmers’ market stalls across Southern California. So when Weiser stopped by the 2013 Science & Food course, he just had to bring a classic potato salad for everyone to try. And what a potato salad it was! With yellow, purple, and red potatoes, Weiser’s tri-color potato salad was as visually appealing as it was delicious. Eating that potato salad got us thinking about the molecules responsible for the creamy yellows, bright reds, and deep purples of Weiser’s potatoes. 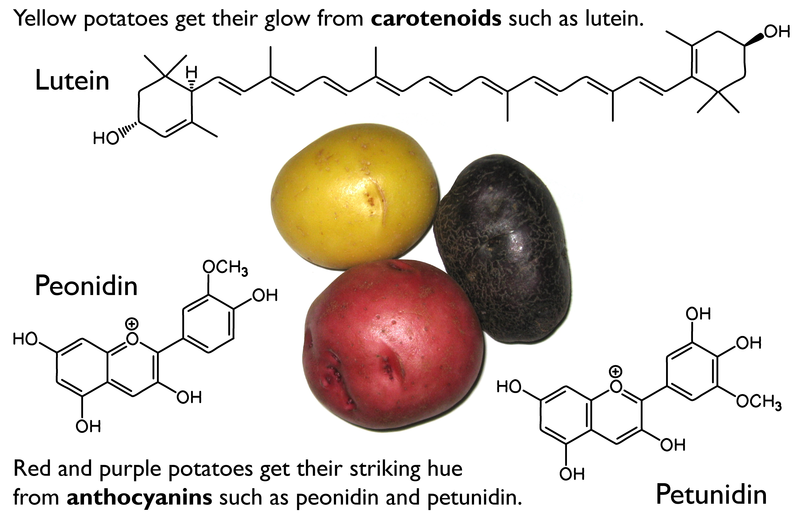 Although many colorful molecules give potatoes their vibrant hues, all of these molecules represent just two large classes of chemical pigments known as carotenoids and anthocyanins. Carotenoids are typically associated with carrots rather than potatoes, thanks to the well-known carotenoid beta-carotene. But other types of carotenoids such as lutein, zexanthin, and vialaxanthin are commonly found in potatoes , and at high enough concentrations these molecules can give potatoes a yellow appearance. Anthocyanins give red and purple potatoes their striking color and are responsible for many of the red and purple colors found in nature. The bold reds of berries, the deep purples and reds of autumn leaves, and the bright hues of many flowers all come courtesy of anthocyanins. In fact, two anthocyanins found in potatoes are named after flowers: peonidin (peonies) and petunidin (petunias) . But what makes one potato variety purple and another red? The difference comes down to small variations in the potatoes’ DNA. Several genes control not only which pigments are created (red, purples, and/or yellows) but also how these pigments are distributed throughout the potato (skin and/or flesh) . For example, Red Clouds have red skin and white flesh, while Purple Peruvians have purple pigment distributed throughout their skin and flesh. 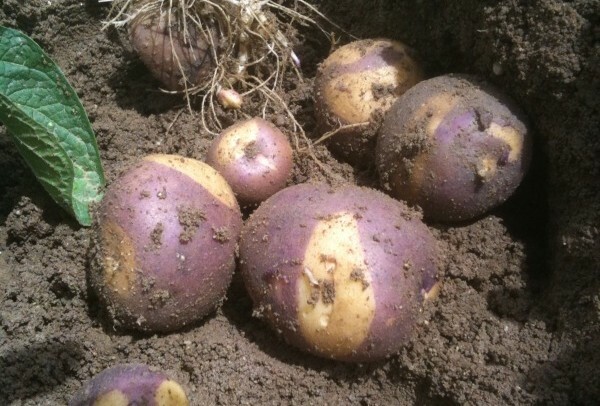 Through a bit of creative breeding, potato growers can manipulate these genes to create a wide variety of colorful potatoes. Take, for example, the Weiser Family Farms Laker Baker, a fancy “chimera” breed that sports a unique, two-color pigment pattern. While we can’t all be potato breeders like Alex Weiser, we can always play with nature’s colorful chemicals in the kitchen. Start experimenting with carotenoids and anthocyanins with this recipe for Weiser Family Farm’s tri-color potato salad. 1. Place fingerling and red potatoes in a saucepan; cover with water. Bring to a boil. Reduce heat; simmer 15 minutes or until tender. Drain; cool slightly. Place potatoes in a large bowl. 2. Place blue potatoes in a saucepan; cover with water. Bring to a boil. Reduce heat; simmer 10 minutes or until tender. Drain; cool slightly. Add blue potatoes, onion, parsley, dill, chives, and eggs to bowl; toss gently. 3. Combine vinegar and remaining ingredients. Pour over potato mixture; toss gently to combine. Serve warm, at room temperature, or chilled. Brown CR (2005) Antioxidants in potato. Am J Potato Res 82: 163–172. doi:10.1007/BF02853654. Jong HD (1991) Inheritance of anthocyanin pigmentation in the cultivated potato: A critical review. Am Potato J 68: 585–593. doi:10.1007/BF02853712. Tags: alex weiser, anthocyanin, carotenoid, chemicals, chemistry, color, DIY, molecules, pigment, potato salad, potatoes, recipe, weiser family farms. Bookmark the permalink. This is great. We’re just covering this topic in the McGill EdX course. Anticarcinogens!